The Hampton Court Palace Garden Festival is the largest flower show in the world with over 600 stalls. 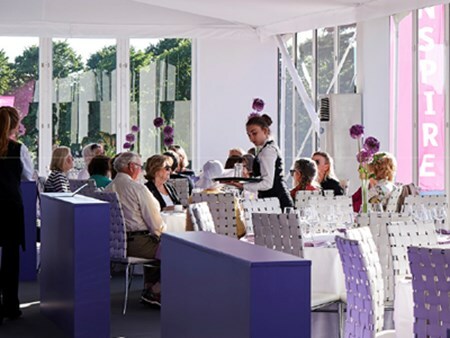 The RHS Hampton Court Palace Garden Festival offers an exclusive hospitality opportunity and a perfect space in which to relax and savour fine food while soaking up the atmosphere. Enquire today to secure your official Hampton Court Palace Garden Festival hospitality packages at this year's fantastic event. Treat your friends, family or clients to first-class cuisine and premier service in the spectacular surroundings of one of the most famous and glamorous garden shows in the world. Situated in a prime location with immediate access to the displays, the Dig In Restaurant also benefits from an outside terraced area which provides you with the perfect setting to enjoy the show. Bookings are taken for groups of 2 upwards. Can't find your favourite Hampton Court Palace Garden Festival - Day Four package?